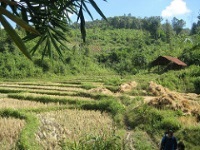 Since the early 1970s, northern Thailand near Chiang Mai has been a popular base for hill-tribe trekking in Thailand. Treks into the mountains and forests of the north, inhabited by the hill tribes, are a popular tourist attraction. Presently there are over 100 companies based in Chiang Mai, the centre of tourism for hill-tribe trekking, offering treks into the mountains, and as these treks can be dangerous, tourists are advised only to trek with companies registered with either the Professional Guide Association or the Jungle Tour Club of Northern Thailand. Hill tribe trekking in Thailand round the Chang Mai and Mae Hong Son regions allows tourists a glimpse into the rich culture of the numerous tribes living in the mountainous regions of the country, who live off the land cultivating crops, hunting and collecting produce. Their fragile existence is easily damaged and due to the rise in tourism over the past couple of decades, many of these tribes have been commercially exploited. It is important that the way of life of these mountain tribes is protected and that they benefit from any profits made from the hill-tribe trekking experience. For this reason, many of the operating tours in the northern region work with the tribes involved by contributing directly to their village life. As the word 'trekking' suggests, there is a lot of walking involved and it is advisable to be relatively fit and prepared for the arduous trails that await you. The distance travelled and the amount of villages seen per day depends on the tour company, as many will try to incorporate as much as possible into a day. It is advisable to check before booking so that your fitness level will match the trek you choose. Bamboo-rafting on the river and elephant rides are usually included as part of the trek by many companies, although other extras can include traditional Thai cooking lessons and traditional singing and dancing with the village people.